Tunneling is a phenomenon in which a tiny particle penetrates an energy barrier that it could not, according to the classical laws of science, pass across. One way of describing this process, also known as the tunnel effect, is shown in Figure 1. Notice that the y-axis in this graph represents energy, while the x-axis represents position. The graph shows that in order for the particle to move from left to right, it must surmount an "energy barrier." 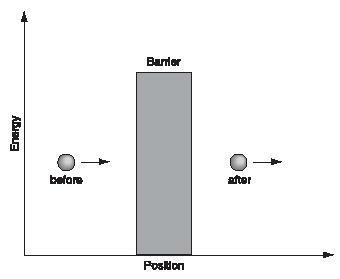 In other words, the particle must absorb enough energy to climb over the barrier. don't push the ball with enough force, it goes only part way up the hill and then rolls back down to you. The tunnel effect would mean in this example that you might give the ball only a slight nudge—not enough to get it over the hill. But after the slight nudge, the ball would suddenly appear on the other side of the hill, right in front of your friend. You might be tempted to say that the ball had "tunneled through" the hill rather that going over it. In fact, that analogy explains the way in which the tunneling phenomenon got its name. In fact, you would never observe an effect like this with a ball, a friend, and a hill. Tunneling occurs only with particles the size of atoms and smaller. The physical laws that describe very small particles such as these are somewhat different from the laws we use to describe large-scale everyday events and objects. The physical laws of very small particles are included in the field of science known as quantum mechanics. One of the interesting discoveries resulting from quantum mechanics is that tunneling can occur with very tiny particles. The chance that the particle can get from position A to position B in Figure 1 is not zero. That probability may be very small (one chance out of one million, for example), but it is something greater than zero. Energy barrier: An obstacle somewhat similar to a physical wall, such that any object must either possess an energy greater than that of the barrier or be able to tunnel through the barrier in order to pass the barrier. Macroscopic: Not needing a microscope to be seen; readily observed by any one of the human senses. Quantum mechanics: A system of physical principles that arose in the early twentieth century to improve upon those developed earlier by Isaac Newton, specifically with respect to submicroscopic phenomena. The interesting point is that once the probability of tunneling is greater than zero, than we know that it probably will occur from time to time. When that happens, we observe physical phenomena that do not and cannot be observed at the macroscopic level. One of the first applications of tunneling was an atomic clock based on the tunneling frequency of the nitrogen atom in an ammonia (NH 3 ) molecule. In this molecule, the nitrogen atom tunnels back and forth across the energy barrier presented by the hydrogen atoms in a pattern that is reliable and easily measured. This characteristic made it ideal for use as one of the earliest atomic clocks. A current and rapidly growing application of tunneling is Scanning Tunneling Microscopy (abbreviated STM). This technique can produce high-resolution images that accurately map the surface of a material. Some of the best STM pictures may actually show us what individual atoms look like. As with many high-tech tools, the operation of a scanning tunneling microscope is fairly simple in principle, while its actual construction is quite challenging. The working part of a tunneling microscope is an incredibly sharp metal tip. This tip is electrically charged and held near the surface of an object that is to be imaged. The energy barrier in this case is the gap between the tip and the sample. When the tip gets sufficiently close to the sample surface, the energy barrier becomes thin enough that a noticeable number of electrons begin to tunnel from the tip to the object. Classically, the technique could never work because the electrons would not pass from the tip to the sample until the two actually touched. The number of tunneling electrons, measured by highly sensitive equipment, can eventually yield enough information to create a picture of the sample surface. Another application of tunneling has resulted in the tunnel diode. The tunnel diode is a small electronic switch that can process electronic signals much faster than any ordinary physical switch. At peak performance, it can switch on and then off again ten billion times in a single second. thanks, the explanation is clear , but when the particle tunnels through would it be a particle or a wave .